a life time cloud connection via SAP Cloud connector, which is the most convenient option. – <hostname> refers to the machine on which the Cloud Connector has been installed. If installed on your machine, you can enter localhost. – <port> is the Cloud Connector port specified during installation (default port: 8443). Now we have to ensure that SAP Cloud Platform is activated and working correctly. Go to SAP Cloud Connector Administrator and see the steps below. – Specify the Service Channel Type: HANA Database and click Next. 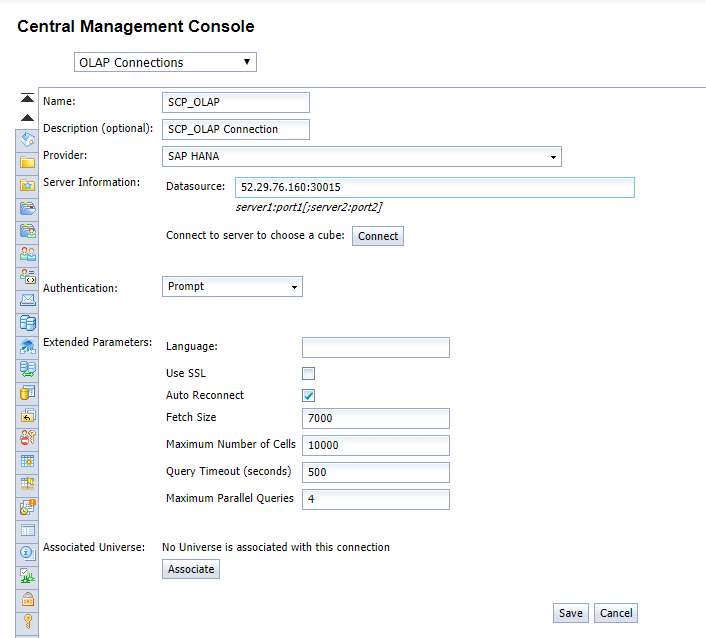 Login to the Central Management Console with Administrator Authorization rights and proceed to OLAP Connection from the Home menu. Select New Connection on the top of the menu. Enter the IP (either public or private) of the server where you installed the SAP Cloud Connector. If instance number is 00, then the port is 30015. After that, we click Connect and enter the SAP Cloud Platform credentials to check that it works. 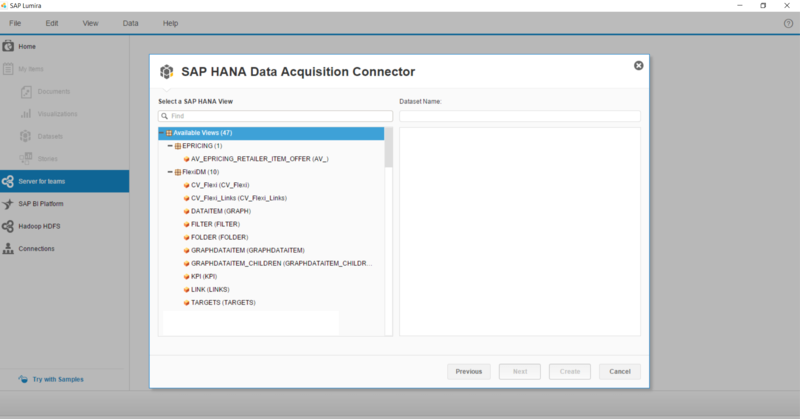 Do not select any HANA view, as you would do if you were setting up a generic connection to select any view for reporting purposes. Instead, click on Cancel in the next window. Select Predefined Authentication type. Maintain user name and password (we will explain the SSO configuration in another blog post). Click on Save. 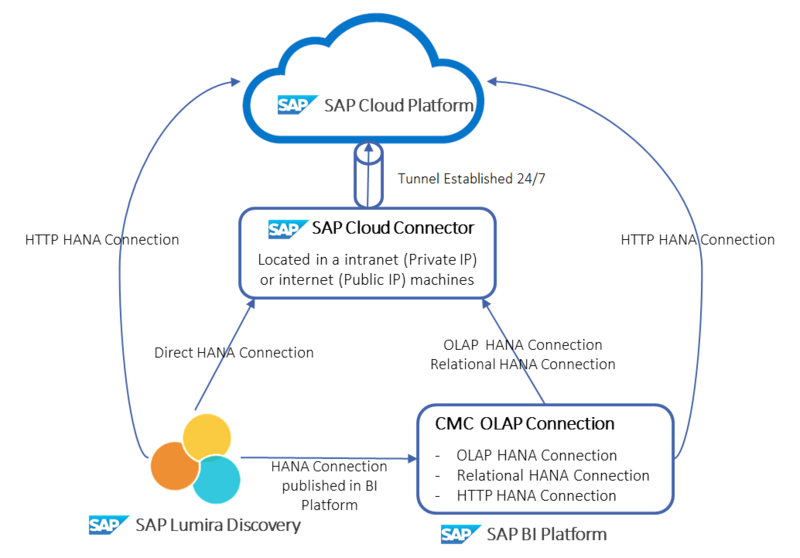 As I got from the first picture, to create a SAP HANA HTTP connection (to consume it with Lumira Discovery in live mode) from SAP BI I should not use the SAP Cloud Connector. Is it right? Can I use this Setup with the HEC, too? Even if I do have my BOE-Server within the HEC – I mean, using the ‘SAP Cloud Connector’ as a Connection from customer Network into the HEC (for local Tools like Lumira, IDT, WebiRC, Tableau etc.)? When are you creating a blog on SSO connection from on-premise BI to SCP? Could this technique be used to connect On-Premise SAP Business Objects BI Platform with say SAP BW/4HANA source system in the Cloud ? Looking forward to know how the SSO connection will work in that case.